Our portable L.E.D Jumboscreens are ideal for any outdoor event, promotion, movie night, fundraiser, or any kind of customer awareness programs. Jumbo Screen Technology combined with modern-day electronics (cell phones, webcams, laptops, etc…) at our finger tips translates into “Advertainment.” This makes it easy to integrate Webcasting, SMS Texting, Proximity Marketing, and Guerrilla Promotions. Our services seamlessly blends these resources into a FUN and Memorable “Show” that draws attention for local venues, special events, promotions and fundraisers. Our innovative text messaging promotions and Jumbo Screens enables guests to not only text message you, and vice versa, but we now can have guests send MMS pictures from their phone up to the Jumbo Video Screen(s) or Movie Screens. Yes, everything is filtered and screened before it hits the screen for public display. Of course the biggest advantage of all this is the Mobile Marketing feature which lets you collect all the cell phone numbers of those participating at your venue, so you can send them promotional messages in the future or just have a better way of monitoring your events and promotions. How do we do help our customers? Our goal is to take any event to the next level by introducing a level of strategic and coordinated marketing with fun and dynamic programming. Using our high-resolution outdoor Jumboscreens we can combine live feeds and interactive marketing techniques for Concerts, Pep-Rallies, Movie Nights, Tailgate Parties, Sporting Events, Radio Remotes and Fundraisers that are professionally coordinated and result oriented so that the event is spectacular, memorable and profitable. Let’s face it, for example showing a free movie in the park is one thing, getting the audience to participate in the branding experience and impacting revenues is truly where the skill comes into play. This is what we do. It’s what we are passionate about and it’s a way of life for us. We have the right experience and equipment to execute memorable events that create relationships, build brand equity and create revenues. Local Sporting Events, Parks and Recreations Departments, Golf Tournaments, Church and School Fundraisers are excellent opportunities to connect with the community and to generate advertising revenue from tie-in sponsors. In every community there are many little league sporting events, soccer games, High School Football games and Community Events, Fairs and Festivals that can become profitable promotions. 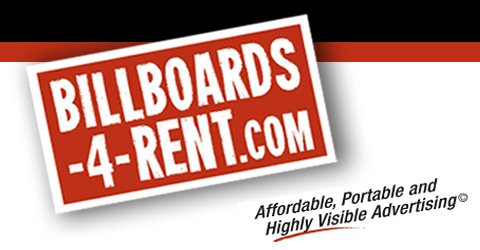 By hiring Billboards-4-Rent, we can maximize your exposure to monetize your event. Call us today (888)708-5558 to learn how you and your group can benefit from our National Advertising and Sponsorship Revenue Programs.